There is a lot of advice that contradicts each other when it comes to preparing turkey for Thanksgiving. Some say not to stuff them; we’ve stuffed our birds for generations without getting sick. Others say basting is the way to have a juicy bird; I find covering it until the last hour of roasting, making sure there is plenty of liquid in the bottom of the roasting pan, produces the juiciest bird, along with stuffing it. The juices from the turkey get into the stuffing and flavor it in a way no other method can achieve. After I get done stuffing the bird, making sure to stuff the neck cavity to make for a round, plump looking turkey, I slather the skin with butter. Yes, butter, don’t start. No margarine in this household; it’s a banned substance. I put my turkey on a small rack in an old square Wagner roasting pan and cover the bird with foil, tenting it and leaving an opening at the top for the steam to escape. The bird is roasted at 325 degrees Fahrenheit. I check every 1/2 hour to make sure there is plenty of moisture in the bottom of the roasting pan as well as baste the bird. I do this for several hours-20 to 25 minutes per pound because it is stuffed. For the last hour of roasting, I take off the foil and always get a beautiful, delicious brown crispy skin on the turkey. Sometimes the front of the turkey will get too brown; just cut off a piece of foil the size of the area and place over it and you’re good to go. The turkey must register 165 degrees F. on a meat thermometer before I take it out of the oven. I measure the temperature in the stuffing as well, to make sure all is good to go. I always let my bird rest for a while before I cut into it. I’m usually finishing up on other dishes, so I let it set for 20-30 minutes. This also makes for a succulent, juicy piece of poultry. I generally roast a 15-17 pound bird, not because my family will necessarily eat that much turkey, but for leftovers. We love leftovers! 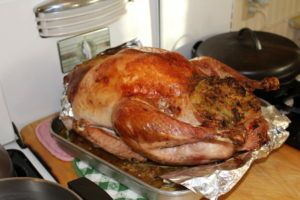 More on what we do with the turkey after Thanksgiving Day-keep reading my blog! Thanksgiving turkey 2015-crispy brown skin, juicy meat and succulent stuffing. Who could ask for anything more?